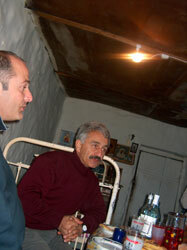 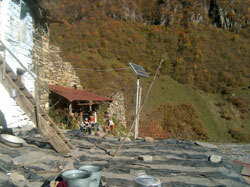 In October 2005, by request of batoni Gugua Marselashvili - head of Gudauri Sakrebulo the Energy Efficiency Center installed the PV system with the 49W pick capacity to the only family lived in Ganisa village. 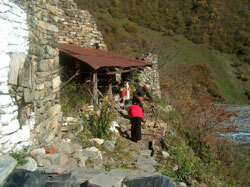 Hard to reach mountain village Ganisa is located in the canyon of river Aragvi on the 1000 m. above sea. 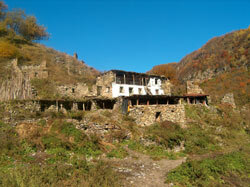 In the middle of 20 century there lived more then 40 family, but even in that time the electricity had never reached the village. 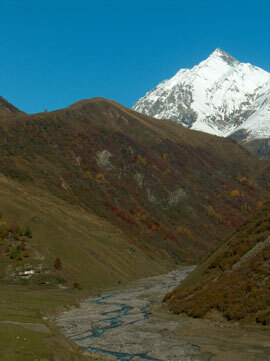 Today, for any of several reasons Ganisa becomes only one family village. 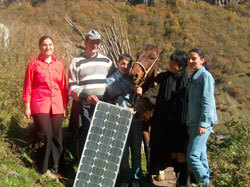 Gugua Marselashvili's idea was with the help of renewable energy sources help family to overcome the energy poverty in order to improve their living conditions. 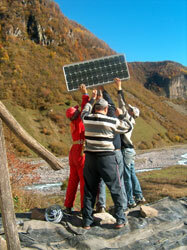 On 25 of October PV systems was successfully installed. 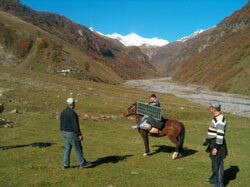 49 W pick capacity of the PV plant supplies 4 (10 W) halogen bulbs and B&W TV, feeds portable radio, mobile phone and flashlight accumulators. 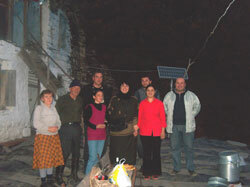 Replacement of the traditionally used candles and kerosene lamps (use oxygen from the room and release combustion products in the room) with 10 w halogen lamps will release of the certain amount of money from the scarce family budget allocated for the purchase of energy resources to satisfy other family needs and improve internal environment of the habitat.